What is the surface area of the following cone? where represents the radius of the cone base and represents the slant height of the cone. The surface area of cone is . If the radius of the base of the cone is , what is the height of the cone? A circle of radius five is cut into two pieces, and . The larger section is thrown away. The smaller section is curled until the two straight edges meet, and a bottom is made for the cone. What is the area of the bottom? A cone has a bottom area of and a height of , what is the surface area of the cone? If the surface area of a right angle cone is , and the distance from the tip of the cone to a point on the edge of the cone's base is , what is the cone's radius? This gives us solutions of and . Since represents the radius of the cone and the radius must be positive, we know that is our only possible answer, and therefore the radius of the cone is . For a right circular cone , the radius is and the height of the cone is . What is the surface area of the cone in terms of ? , which is our final answer. 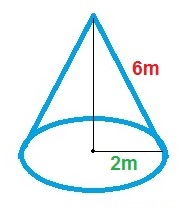 If the surface area of cone is , and the distance between the cone's tip and a point on the cone's circular base is , what is the radius of the cone? Our two solutions are therefore and . Since represents the radius of the base of the cone, it must be positive, and that leaves as our one and only answer. Find the surface area of a cone with a base diameter of and a slant height of . Given the base diameter is 6, the radius will be 3. The given slant height is 10. Substitute the radius and slant height into the equation to find surface area. Find the surface area of a cone with a base area of and a slant height of . Given the base area is , the base of the cone resembles a circle. Using the base area, it is necessary to find the radius. Since radius of the base is 2, and slant height is 6, substitute these into the surface area equation. Find the surface area of a cone with a base diameter of and a height of . Given the base diameter is 6, the radius of the base is 3. The height is 10. We will substitute these values to find the slant height by using the Pythagorean Theorem. Substitute slant height and radius into the Surface Area equation. New York University, Bachelors, Biochemistry. New York University, Masters, Clinical Rich Integrated Science.